Longing for Sleep by Marit Ilison is a conceptual collection inspired by the haunting wish to sleep during the dark wintery time in Estonia called kaamos. 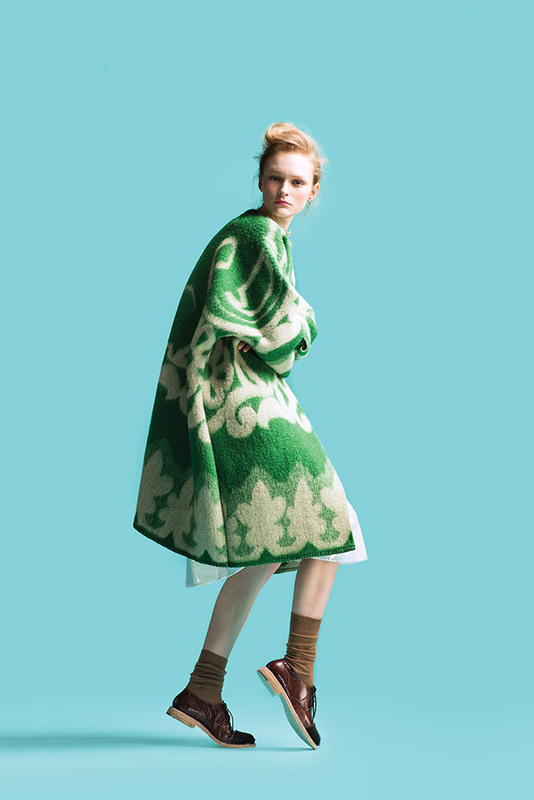 The collection is made out of original vintage Soviet blankets. Marit Ilison: “My collection, Longing for Sleep, is inspired by my wish to sleep during the dark winter period in Estonia, when I know I should be working. The crystal details in the coat are like sand on your side, or a pea under the mattress.” The collection was created to materialize the feeling of staying in the warmth all day. Using old and abandoned Soviet woolen blankets that together with playing with the form, are also playing with nostalgia and every viewer’s and wearer’s personal feelings connected with sleeping and warmth. The bead-embroideries on the reveres of the coats are controversial like dreams and the pricking conscience - they are beautifully shimmering, yet uncomfortable and annoying. Marit Ilison is a freelance artist and designer working in the fields of conceptual art, fashion and perceptional experiences. Her designs start from a feeling or an idea which create haunting, memorable experiences - be it the serenity of one of her conceptual installations, or wearing a simple black dress. Arising from a passion for concepts, pattern-making and tailoring, Ilison’s work is a mesh of deep ideas and precise technical execution. Ilison prefers not to label her collections by season, instead creating timeless ready-to wear pieces that allow for effortless dressing and comfort. After receiving an MA in Fashion Design from the Estonian Academy of Arts (where she now lectures), Ilison has gained design experience in London, Antwerp, Paris and Berlin, where she worked for Bruno Pieters, Camilla Staerk and pattern-making atelier Trois Quarts among others.